Every project JE Dunn undertakes involves a multitude of moving parts – equipment commissioning, delivery scheduling, construction process coordination, safety planning, and others. From project start through project completion, JE Dunn's Engineering Services Group consisting of in-house designers and engineers strives to ensure building quality. Necessity is a driving force for innovation. JE Dunn's need to communicate critical information led them to the use of Google SketchUp as a way to deliver information in an efficient, clear and meaningful way. During a project building envelope coordination meeting, the JE Dunn team found it difficult to communicate the complexity and overall project scope to the various teams involved in its construction. The coordination between the teams in the installation process was particularly important as they needed to ensure a water-tight product. 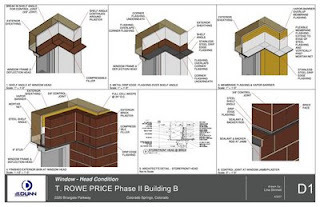 The JE Dunn team turned to SketchUp to virtually mock up complex parts of the project, such as the window installation, into 3D SketchUp models. These 3D models were then presented at the job site enabling the participants to visualize the complexity of the install and understand the sequencing of parts. For all involved, it was as though a light bulb had been turned on. JE Dunn had used SketchUp to drive a much deeper level of collaboration. The results were an improved way to pro-actively identify and address project issues, generate better solutions as a collective team and, in the end, the production of a high-quality product with stakeholder sign-off. 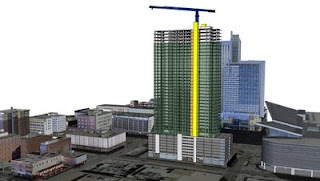 Coming out of this success, JE Dunn began using SketchUp on other projects, eventually standardizing the way it uses SketchUp to drive quality improvements and lower costs, and even mandating the use of virtual 3D building envelope mock-ups on projects costing $20 million or more. Today, JE Dunn uses SketchUp throughout the planning and building process. With SketchUp, the company and its subcontractors rapidly prototype and compare design options. Using SketchUp, JE Dunn precisely and efficiently develops building skin installation sequences. With LayOut, the 2D design documentation feature of SketchUp Pro, JE Dunn is able to combine traditional 2D information with their 3D model information into coherent and useful documentation for teams to use in the field. "LayOut helps formalize how we put the information together. It becomes the glue that brings it all together in an organized fashion" says Rodd Merchant, Vice President of JE Dunn's Rocky Mountain Engineering Services Group. In combination with Google Earth, the company uses SketchUp to plan project logistics, from fencing to deliveries to construction site traffic flows. It is used to help clients visualize and better understand the status of projects, and how and why clients will have to make temporary adjustments to their workplace and workplace processes in order to accommodate for different phases of construction (for example, when a project will require the temporary closure of one wing of a client’s building). The complete case study is posted on our website and you can also view additional models from JE Dunn. Sometimes spellswow gold will fail to wow goldwork. If a buy wow goldspell fails, you buy wow goldwill still gain cheap wow goldthe base experiencecheap wow gold for casting the wow power levelingspell and you wow power levelingwill still use power levelingthe runes requiredpower leveling the image on the right. It's a great thing to see JE Dunn continuing to increase this SketchUp/BIM awareness. I'm surprised I didn't see this case study sooner!